We are a leading Manufacturer of meteorological sensor from Pune, India. We are engaged in offering our prestigious clients a very highly premium quality range of Meteorological Sensor for measuring Soil temperature. Our clients get the product from us at very reasonable rates and are delivered to them within the specified time frame. Our range is available at market's leading prices. 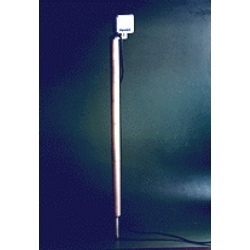 Sunpro Soil Temperature sensor consists of a PT1000 RTD embedded at the thermally isolated tip of an SS316 probe 25 CM in length. The depth at which the measurement is to be made can be adjusted using a position adjustable ring provided on the stem. The sensor wires are terminated in a weather proof SS head and a 20 meter cable is provided for connection to Datalogger or other circuitry. Looking for Meteorological Sensors ?